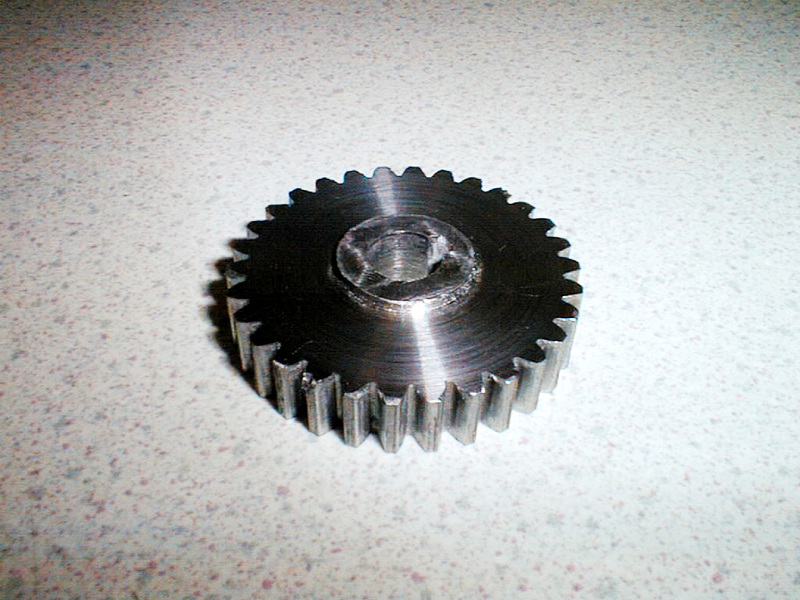 Sadly, the mini-mill digested part of its gearbox recently (ironically while cutting a gear hob). The sliding transmission gear ended up in over a dozen pieces when the spindle jammed, so a replacement for this gear is on its way along with a spare set of ALL gears in case this happens again. 06-Dec-2002: The replacement gears have started turning up. 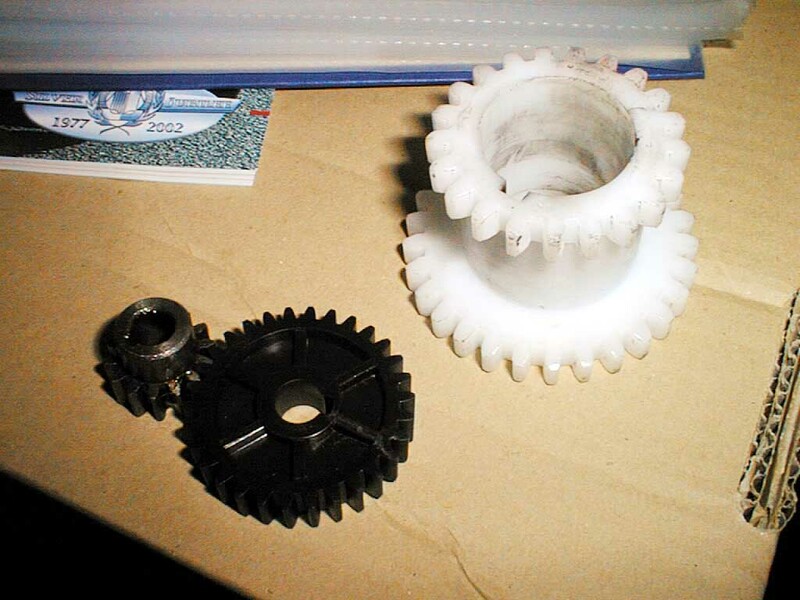 The white gear on the right is the existing static transmission gear which did not disintegrate, although it's a little rough round the edges. Shown on the left are the new motor pinion and gear - the pinion is metal. Exercise care when knocking the spindle through the bearings. The material is a lot softer than I was expecting and the end of the threads got mashed with almost zero effort. 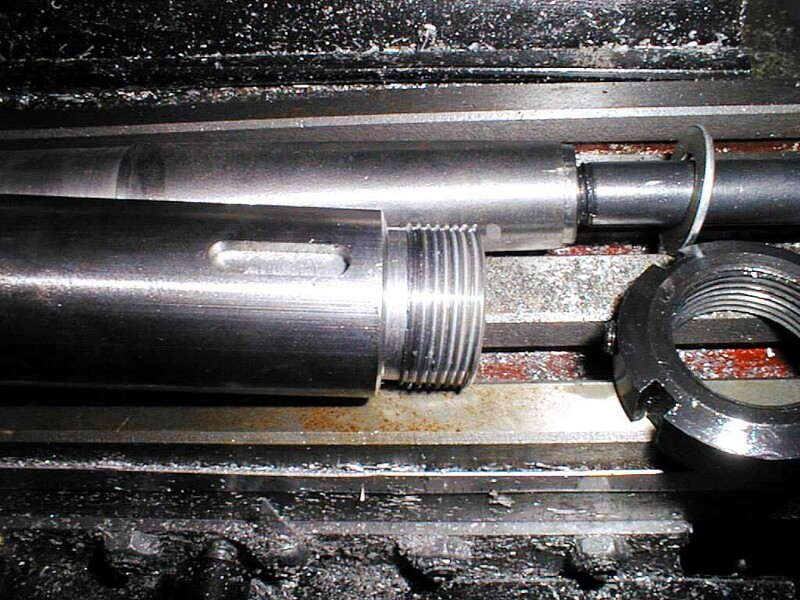 On my mill, the spindle is a slight interference fit in the bearing bore so if you need to take it out, make up a mandrel and hydraulically press the spindle out to avoid the kind of clueless mistake I made here. The gearbox divested of all its innards. For reference, the bearings are metric and are plain ball bearings - not taper roller or angular contact. The large bearing is 62mm OD x 30mm ID x 16mm type 80206 which cross refs to SKF type 6206ZZ. 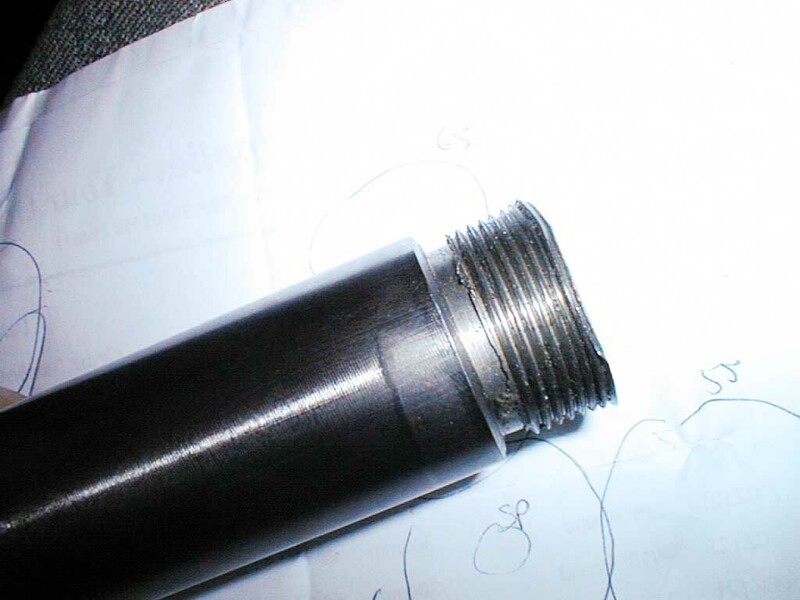 The small bearings for the countershaft are type 80101 which appears to be SKF type 6001-2RS (28mm OD x 12mm ID x 8mm). 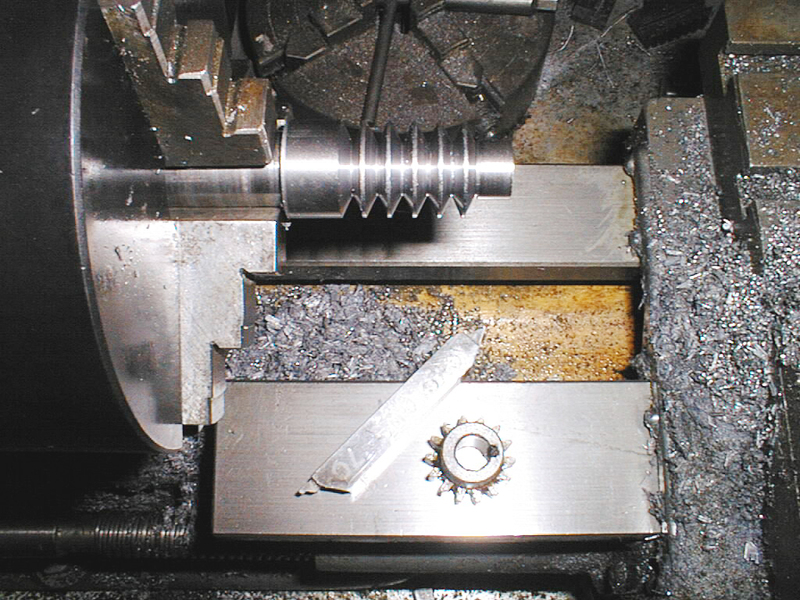 26-Dec-2002: Still no gears, still no milling machine. The kind folks at GLR have cut me up some steel gear blanks, so I've started making a metric module 1.5 hob from some 3/4" Silver Steel (drill rod) to put some teeth on them. The gear hob has its own project page you can get to by clicking here. 28-Dec-2002: Thanks to the nice people at LittleMachineShop.com, the new gears have turned up. 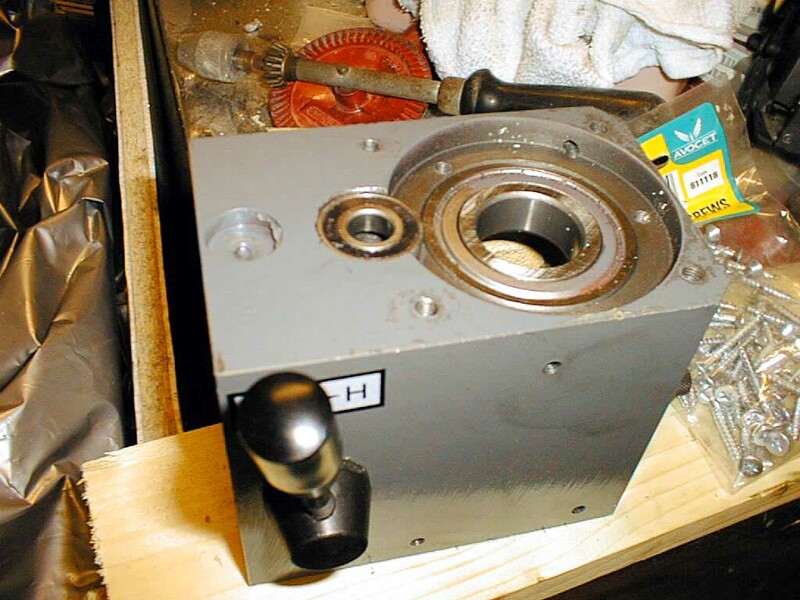 7-Mar-2003: Rotary table bracket/tailstock are complete, as is the hob - these items have worked out well so far. Should be able to make the 30 tooth motor gear before too long. 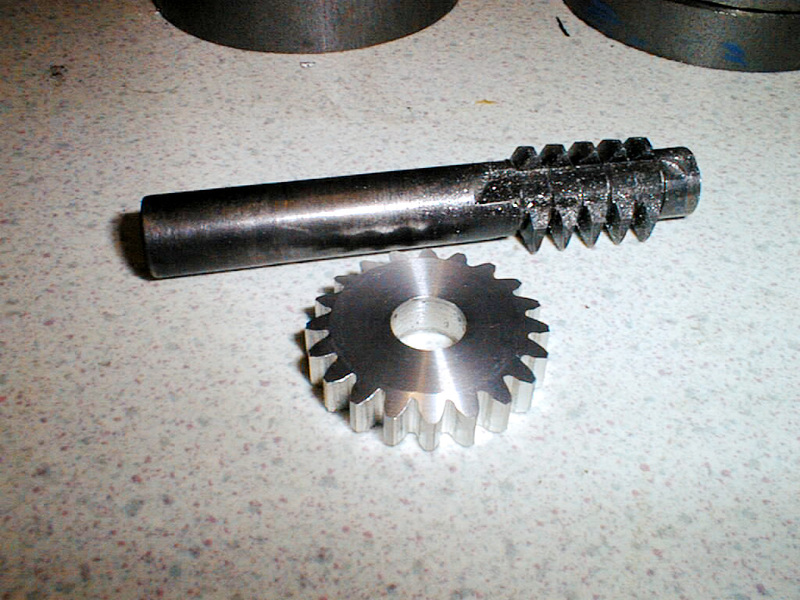 16-Mar-2003: This is the 30 tooth gear that meshes with the motor pinion. Something is not right, the teeth look the wrong shape and the hob used to cut it is bent (during the heat treatment? ).